Now what does this post have to do with chic bathrooms you ask? thinking about taking up blogging. I have been reading The Decorista since before she called herself The Decorista. She doesn't know that, she doesn't even know me, or that I am writing this post, but here's the thing, when she posted that she had written an e-book I was intrigued. Sure I have visited tons (TONS!!) of sites that explain how to write a great blog, borrowed books from the library, sat in Chapters flipping thru others and bought a Problogger book and a Blogging for Dummies book, because I really really want to make my blog the best little blog it can be (I’m still in the “working out the kinks” stage); but no matter how many “how to's” I have read, I have always wanted to hear the “how to” from someone like me - a chickie writing a blog similar to what I wanted to do. Most of the “how to’s” I’ve read have been written by people who write blogs on blogging. Don’t get me wrong, I have learnt a lot. They have been great. I have a whole list of items I still need to implement. However, I still wanted to see behind the scenes of someone who built up a blog about design or decor or fashion. I've always wanted to email or comment on some of my fav blogs to ask them how they created their magic, but I never have. I always put it off, saying I will reach out once I have built up some traction. Silly thinking, as I have learnt from reading Ashlina’s book. The price: $14.95. I was so, so, SO happy with this price. Having been tempted to buy e-books & e-courses before, I have always stopped short because the price tags were always more than I was willing to risk. Thanks Ashlina for making it a fair price. Tone: Her writing style is so easy to enjoy. You feel like you are sitting in a coffee shop with a good friend giving you advice. It feels more like you are reading a stylish magazine then a textbook. She did a beautiful job designing this book. Her honesty is refreshing. She didn`t have to write about how she couldn`t find a job in her chosen field or how she’s intimidated by Photoshop or how blogging changed her life. We never would have known, but I`m glad she did because it makes her book that much more motivating and relatable. Q&A`s with popular bloggers: A few of my favorite blogs like Jen’s MadebyGirl, Paloma's La Dolce Vita and EverythingFab by Sasha and a bunch who I look forward to discovering, give behind the scenes peaks into their world and offer words of advice and encouragement. Just what I have been looking for! It was interesting to see how similar and different each responded to the list of questions. Reading these gave me some resources to check out and makes you realize no you don`t need to know how to do everything perfectly to have a great blog. Components: She gives a good overview of all the major details you should be addressing re your blog. She gives some great advice re things she did to build up her blog. She doesn`t bury you in details. If you want detailed comparisons of which blogging platform you should select or how to use Twitter, you will not find it here. That is what I particularly like about this e-book, it takes away the overwhelm you often feel. This book gave me just what I was looking for; enough tips, tricks and Ashlina’s “how she did it” to get her to where she is today. The book also reinforces the idea that you are not going to get your blog perfect the first time and that it’s ok and the encouragement to keep on blogging. At 77 pages, it covers enough to get you pumped up. I have read it once, took notes and am going to read it again. Then I’m going to use it as a checklist. Anything I would have wanted more? I would have loved to be able to read this on my iPhone.Silly little phone doesn’t like Adobe Acrobat. A couple of specific details that I’d like to know more about, but now that she mentioned you should email your fav bloggers, I might just do that! Who I think would benefit from this book: Anyone who is feeling overwhelmed or intimidated about starting a blog or who has started one but is spinning their wheels or anyone thinking about starting a blog and wants some advice. Seeing all the pretty blogs out there and the vast amount of “how to`s” it is so easy to not try, I know I procrastinated for a long time. This book covers the basics, it gives some great tips and ideas, and it reminds you that the great bloggers out there once were where you and I are right now, so stop waiting and jump in. This is just my humble little opinion. Take it or leave it. Whenever I've thought about buying an e-something before I've always tried to find some reviews (not so easy!). So I hope this one gives you some insight into this e-book. Also, this post is just my way to say thanks Ashlina for writing a blog I enjoy reading & for writing a smashing e-book that gives a glimpse behind the scenes. And one last thing, you dedicated your book to your Grandfather and I just have to say, I'm sure he is super proud of you and all you have accomplished. Congrats. 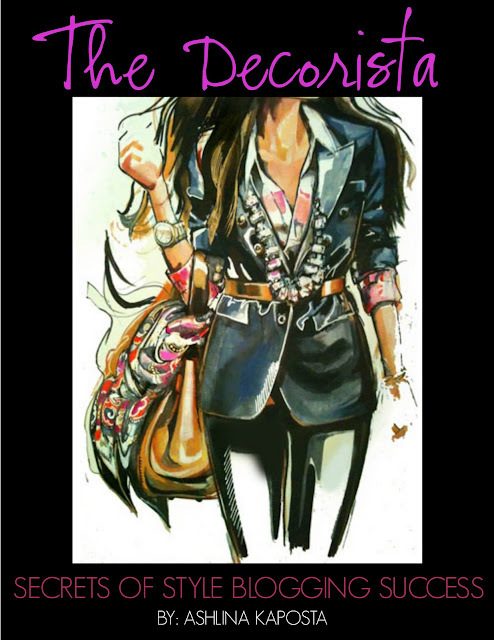 If you are interested in getting your hands on her e-book you can find it on her site: The Decorista (this is not an affiliate link). Leave me a comment to let me know if it was useful for you.